In anticipation of his upcoming conference co-presentation, CNNs: A Game Changer for Manufacturing?, at Deep Learning World in Las Vegas, June 3-7, 2018, we asked Abbas Chokor, Staff Data Scientist at Seagate Technology, a few questions about his work in deep learning. Q: In your work with deep learning, what do you model (i.e., what is the dependent variable, the behavior or outcome your models predict)? A: As the volumes, variety, and velocity of produced data from our production lines increase, our organization is committed to support its internal stakeholders all over Seagate to make the factory smarter. Our engineers and operators are challenged every day by TB’s of data from thousands machines and drives that require visual inspection and analysis. With the rise of deep learning as a promising solution in the area of object detection and image recognition, Convolution Neural Networks (CNN) are unlocking the value of our data in many applications. For instance, one of our models is able to accurately detect and find physical and magnetic defects in our products. Another model is boosting the security of our facilities through automated facial recognition as a new way to validate employee access. Q: How does deep learning deliver value at your organization – what is one specific way in which model outputs actively drive decisions or operations? A: Seagate produces and ships daily hundreds of thousands of drives. What is easy and quick for a CNN is hard and dull for humans. Deep learning models are able to detect defects in our products in very early stages and substitute human biased visual inspection. They are also able to replace the manual check-in/check-out of operators and visitors by an automated video surveillance system. As such, deep learning is efficiently shortening our production cycle’s time, improving the quality and reliability of our products, and therefore reducing costs. See the answers to the following questions and other interviews on the blog. Q: Can you describe a quantitative result, such as the performance of your model or the ROI of the model deployment initiative? Q: What excites you most about the field of deep learning today? Q: Sneak preview: Please tell us a take-away that you will provide during your talk at Deep Learning World. Don’t miss Abbas’ conference co-presentation, CNNs: A Game Changer for Manufacturing?, on Wednesday, June 6, 2018 from 1:25 to 2:15 PM at Deep Learning World in Las Vegas, June 3-7, 2018. The countdown has begun! That's right, 1 week remains until the inaugural Deep Learning World kicks off at Caesars Palace in Las Vegas, Nevada, June 3-7. Join us in Las Vegas for the inaugural Deep Learning World (DLW), the premier conference covering the commercial deployment of deep learning. The event's mission is to foster breakthroughs in the value-driven operationalization of established deep learning methods. Check out the full agenda and see all the reasons why you can't miss the first ever Deep Learning World event. Rates go up on-site — register today and save. 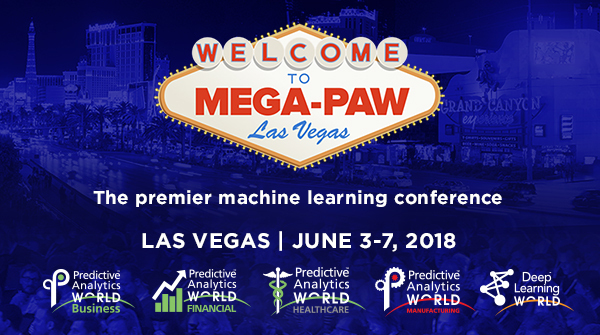 In 2018, there will be only ONE PAW in the U.S. – Mega-PAW – with five (5) parallel events amounting to seven (7) tracks: PAW Business, PAW Financial, PAW Healthcare, PAW Manufacturing, and Deep Learning World.